Portland's most recent stop-data report showed that of the 9,000 motorists who were stopped between July 1 and Sept. 20, 2016, 68 percent were white, 14 percent were black, 8 percent were Latino, 5 percent were Asian and 5 percent were unknown or other. Photo by Lee van der Voo. Each month we email InvestigateWest members Sidebar, an exclusive dispatch from our newsroom. Get Sidebar hot off the press by becoming a member today. This month, I offer a behind-the-scenes look at a very snowy ride with Officer Kevin Allen of the Portland Police Bureau. As luck would have it, it was Jan. 10 when the bureau set me up for a ride-along with Officer Allen. The Portland native ended up being my tour guide during one of the biggest snowstorms the city has seen in two decades. Our ride was a Ford Crown Victoria, at least before we had to trade it in for a more snow-savvy model. Before the night became a catalog of snowbound cars and snowball fights, Allen focused on responding to calls in the downtown area. Beginning at about 5 p.m., our first call is to arrest the solitary employee of a parking garage. And since I’m not reporting any major crimes here, I’m going to leave the embarrassing identifying details aside. There is probable cause to arrest the fellow, who happens to be in charge of the car keys at the establishment. And, since it was just about rush hour you can imagine how that played out. People lining up, trying to collect their vehicles, while Allen, with a brief assist from another officer, whisk the cooperative gentleman to the back of a police car. Earlier in the week the man had failed to respond to officers looking for information about a domestic dispute. 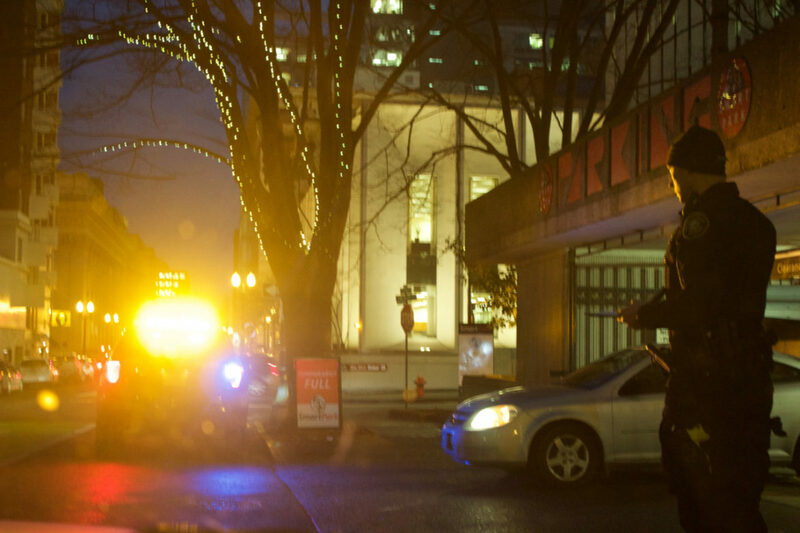 I don’t know what became of him – which I suspect is often the case for police officers – except to say we left him sitting in front of a television at the Multnomah County Jail awaiting processing. His patrons were reunited with their car keys once a second employee got to the scene. The jail, meanwhile, was an interesting place. Turns out the deputies there, in addition to being on top of all the frisking you’d expect from watching TV, are great collectors. They collect all kinds of things: shoelaces, belts, wallets, keys and anything you might find in the pockets of clothes. They collect the clothes, too. Most of these items get sealed into plastic bags, then passed beneath a window with bars on it. Behind the window, guys in blue pajamas walk single file, looking very much like they wish to be elsewhere. Deputies collect fingerprints, too. And since they don’t have eyes in the back of their head, they also collect mirrors, which adorn the walls of this mostly green-painted institution. Much of everything else is green here, too, except for a giant drug identification chart on a wall. It’s a universe populated by rubber gloves, metal mesh, and neat rows of chairs in front of a television, where we leave our man seated for whatever kind of night he’s in for. Hockey is playing. No remote. By 6 p.m. we drive around downtown while the calls roll in on Allen’s radio. Crashes. A fight on a MAX train. And a transient trying to light his socks on fire. We take the man to the warming shelter at the Bud Clark Commons in Old Town and watch to see that he gets inside. From the look of the man’s shoes – he has no shoelaces – Allen shares his suspicion that he, too, recently has been to the jail. Then we drive some more, with Allen putting flares around an abandoned vehicle we come across, then heading to a homeless encampment at Southwest 10th Avenue and Clay Street to check on a call about yelling. It turns out a couple there is OK – they thank the officers for their concern – and we roll on. Meanwhile, the radio keeps chattering. A drunken female falls down on Alder. A woman who was just released from the hospital does not answer her door. A man is sleeping in a lobby somewhere. And vehicles are starting to get marooned on the Southeast Powell Boulevard ramp. The snow starts hitting hard around 8 p.m. And all of this activity piles up in a queue on the mobile device in Allen’s vehicle. It looks like a computer (it’s called a mobile audio video system – MAV, for short). And on it you can see all the available cars and which ones are dispatched where. Radio chatter augments the visuals so you can hear how the officers inside the cars are responding to calls. In cases where they need to stage their entry, for example, the coordination goes on over the radio, with dispatch piping in. 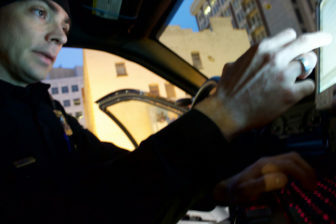 Portland Police Officer Kevin Allen logs data after a stop. Allen cautioned me he needs to listen to all that while we’re responding. So I try to keep quiet while we respond to a call at a hotel, where a man who has been drinking since lunchtime was causing a fuss before he vanished – perhaps temporarily – without paying his tab. There are a few minutes of conversation with the staff there, but the guy does not return. So we roll on to the next scene, which turns out to be checking on a group of young people under the awning of a former beauty school, who look like they might need help finding a place to go in the cold. They thank us but say they’re all right. Allen fills me in on how the youth shelters work, and explains how some of the young people may not have as many options for shelter as they age. We change cars, filling the last one with gas. There’s not much to say. But the air does get heavy. Nobody wants to hear such dire news. And even for someone who is probably practiced at it, Allen is not callous about it. We drive to a parking lot where he shows me how the MVA works. Here I realize he can make a lot of his reports right from the car if there’s time. Then we drive a bit, until a trucker blows a red light right in front of us – and Allen has to write a warning. There’s a small technology failure when the RW420 Mobile Printer mounted in the car fails to print. So Allen goes for the old-fashioned warning, written on paper with a pen. By 9:30 p.m., the storm has taken over. There are stalled cars in a tunnel, a marooned ambulance, and something like a snow-bunny contest is covering Pioneer Courthouse Square. People are trying to give a snowman an umbrella in the park blocks, where the wind picks up and a tree falls. And the sky suddenly lights up in an eerie blue when a transformer heaves its last breath somewhere up in Northwest. There are still a dozen or so tents lining Southwest 10th Avenue, where nearby shopping carts are piled under inches of snow. Alarms start going off. Wrecks start piling up. Meanwhile, we head to a disturbance on the MAX, where a woman who will be headed to detox shortly has been threatening older passengers. Here I notice the MAX is dragging, and my journalistic Spidey sense tells me that if I don’t get on one soon I won’t be going home tonight. By now the snow is a good 8 inches deep, so we say our quick good nights. Takeaways: Police spend far more time working with the homeless than I ever imagined, and I am eyes wide open on such things. And with the volume of calls to 911, there is scant little room for actually initiating police stops. That surprised me, too. It’s nice to be surprised. Even when I think I know how things work, often when I get out into the field I realize sometimes I don’t. So it was good to take the time to see and learn about policing. Now, while I’m working on a related story, I’ll be better equipped both to handle the information and to appreciate all the perspectives that come into the story I have to tell. Lee van der Voo is managing director of InvestigateWest. She coordinates and reports on projects in Oregon. She can be reached at lee@invw.org. I’m tickled that I finally get to write about the Unequal Justice series collaboration today, one of our most ambitious partnerships to date and, certainly, the largest data project InvestigateWest has ever been involved with. I love this project.